Mahindra has launched its flagship SUV, the Alturas G4. The full-size seven-seater SUV is available in two variants - 2WD and 4WD - priced at Rs 26.95 lakh and Rs 29.95 lakh respectively, ex-showroom pan India. Both variants get the same 2.2-litre, four-cylinder diesel engine that makes 181PS of power and 420Nm of torque. This engine is paired with a 7-speed torque converter automatic, sourced from Mercedes-Benz. The Alturas G4 is well-loaded, boasting of features such as HID projector headlamps, napa leather upholstery, ventilated seats, sunroof as well as a 7-inch display in the instrument cluster. Be sure to check out our review of the Alturas G4 before cutting a cheque! 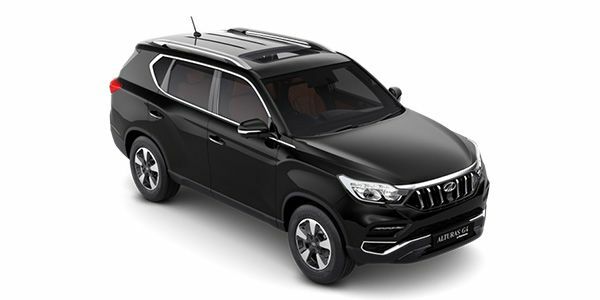 Mahindra Alturas G4 prices start at Rs. To Be Announced (Ex-Showroom). Mahindra Alturas G4 is available in 2 variants and 5 colours. Share your experiences with Alturas G4? The claimed ARAI mileage for the Mahindra Alturas G4 diesel is 12 kmpl. Q. Between XUV 500 and Alturas G4 which one is the best as the XUV 500 is at an affordable price with some offroading capability and the Alturas is priced at a very high range. Q. Liked this SUV but am confuesed it with Fortuner and Kodiaq. Q. How's this SUV good or bad? Q. Why should I prefer Alturas G4 over Fortuner or Endeavour? Q. Is this a very nice luxury family car? Q. Any idea on service cost of Alturas G4. Is it more than Fortuner and Endeavour? Confused about Mahindra Alturas G4?